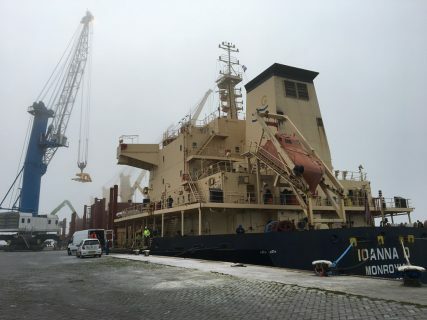 On the Thursday afternoon of 15 November, Wijnne Barends Logistics received the breakbulk vessel Ioanna D in Eemshaven. This vessel, with a length of 180 metres and a breadth of 28 metres, moored in Julianahaven to unload some 26,000 tons of rolled wire for the company Van Merksteijn International. The cargo originates from Turkey and is among the biggest cargoes ever delivered in Eemshaven. Unloading the rolled wire from the impressive vessel is expected to take six days. The shipping agent is Wijnne Barends Agency.